Models QSP-713 and QSP-713S (speaker) offer a hefty transfer area. 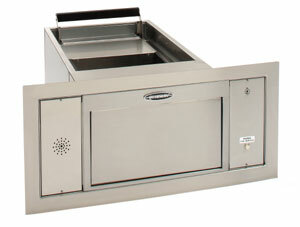 This unit was designed to provide easy performance when transferring large and bulky items. It works exceptionally well for pharmacies and bank commercial customers. With a transfer area of 13" (w) x 7 1/2" (h) x 18" (d) this drawer is large enough to efficiently pass the largest of prescriptions, as well as convenience items like bags of ice, a gallon of milk or a fridge pack of beverages. Smaller items such as credit cards, cash and prescriptions can be easily transported as well. When the Speaker (Includes speaker, customer microphone, and call button) is ordered with the Audio Authority 1500A Intercom as a package, the system is Prewired and Tested to ensure a trouble-free installation.